Bright, cheery gingham. Love it! Here's how you can make a some of your own. 1 piece of fusible batting or fleece, 15.5" x 20.5"
Iron your batting to the wrong side of one of your pieces of fabric. Pin the batting/fabric piece to the other fabric piece, right sides of fabric together. Sew, leaving a 4-5 inch gap for turning. Snip corners, being careful not to cut into the line of stitching. Turn right side out and gently poke out corners with a knitting needle. Press, making sure to fold in the fabric from the gap you left for turning. Line up your presser foot with the first line of top stitching and topstitch around the edge again. That's it! And if you still have some time left over, go ahead and make some napkins for yourself, too! simple, yet so pretty! i'm working on some placemats right now. So pretty. I always love the things you come up with! I would love it if you joined my "Saturday is Crafty Day" party on April 24th! Stop by my blog for details. I finally have a sewing machine! I'm really looking forward to starting a few of these projects. These are so pretty. I have never been a placemats person but I am rethinking that now! I really need to learn how to make cool things like this. such a cute blog! Those are adorable. We could use some new ones for sure! Cheryl -- these are awesome! Thanks so much for sharing the instructions. So cute Cheryl! Mealtime at your house must be the most cheerful place! 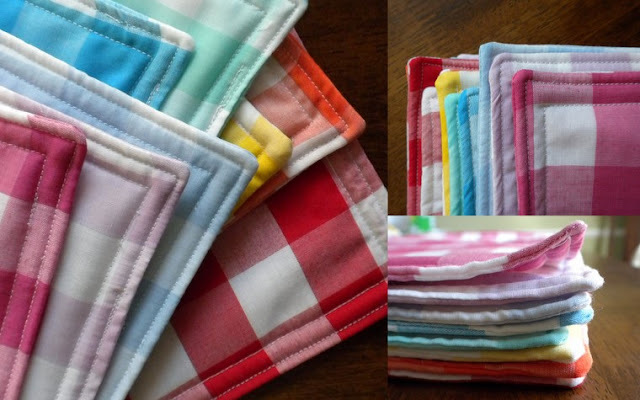 Aww, these are so pretty and cheerful, I love the gingham! Thanks so much for sharing, I'll be linking. what is your dish pattern, and is it still available? I dropped a large stack of my dishes one day, and at some point I'm going to have to replace them. I love my plates and bowls, but they've been discontinued, and so I've been thinking about new ones. I like yours. Hello! I was looking for a fun new project to start and I came across your awesome place mats. I am now trying to make my mother in law some for mothers day and was wondering if the fusible batting holds up in the wash? or what you recommend? Thank you for the wonderful Idea! sorry I know I am a little late in commenting,I LOVE these! and bookmarked this straight away but it has taken me awhile to get the fabric. I was wondering if these are washable? I have 2 kids and I run a dayhome so I would like to make some but I know I would need something I could wash. Here is my website: "mad staggers"